Olde English Bulldogges are a very distinct breed with a large undershot jaw and protruding bottom tusks. They have cobby but athletic bodies and large heads. The forehead is flat and they have a short broad muzzle. The Olde English Bulldogge has muscular shoulders and a dewlapped neck. Courageous and bold, but eager to please! Olde English Bulldogges originated in England. Olde English Bulldogge males are 18 to 33 inches (46 to 85 cm) high. Olde English Bulldogge females are 17 to 22 inches (43 - 53 cm) high. Male Olde English Bulldogges weigh 65-145 pounds (29 to 65 kg). 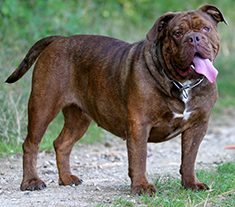 Female Olde English Bulldogges weigh 65 to 135 pounds (29 to 60 kg). The Olde English Bulldogge may be gray, black, brindle, red, brindle spots on white, fawn, red, black or black & white. The Olde English Bulldogge requires little grooming and is an average shedder. Olde English Bulldogges are calm but can be bold and fearless if required. They are protective of their master and property by nature, and females are more territorial than males. This breed likes to chew and should be provided with extra hard chew toys, as softer ones are demolished and may be choked on. Olde English Bulldogges are courageous and bold and have been known to over exert themselves in order to please their masters. Olde English Bulldogges are susceptible to bloat and hip dysplasia and should not be overfed. Olde English Bulldogges can be expected to live 11 years or more. Adaptable to almost any lifestyle the Olde English Bulldogge is naturally slow due to its bone structure and should not be over exercised as puppies. Olde English Bulldogges do not fare well in extreme heat or cold. This breed requires moderate exercise to stay happy and healthy. The Olde English Bulldogge is not recognized. Find Olde English Bulldogge Puppies with our Free Breeder search!